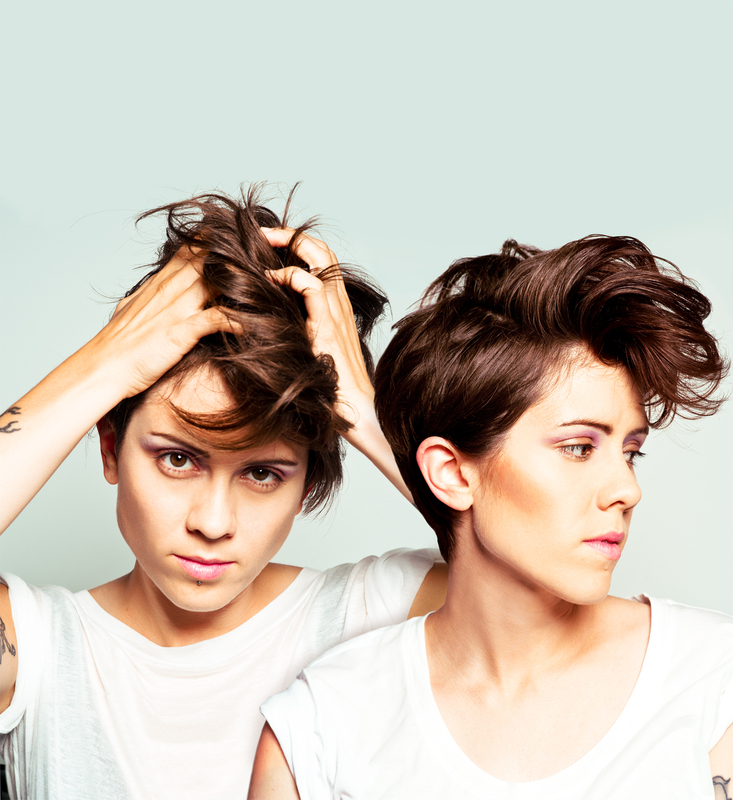 Tegan and Sara | True Endeavors Presents: music, tours, tickets, mp3 downloads, concert pictures, videos, Madison WI. You’ve probably already heard that indie music’s favorite twins are coming to Madison this Sunday evening, but did you also know that you could score some free tickets for yourself and a friend? Well, it’s true! Just answer our simple question after the jump to enter to win! While you’re at it, check out Stereogum’s picks for the top 10 Tegan and Sara songs. Do you agree with their list? What would you add? We’re thinking you’ll probably hear more than a few of ’em at their show! Before they hit the Orpheum stage on February 24 (got your tickets yet? ), Tegan and Sara will pay Ellen a visit, and treat viewers to a performance of their brand spankin’ new tune “Closer” from Heartthrob. Catch them on air today (Wednesday, February 13) on ABC at 3:00pm. Tegan and Sara are back — with a vengeance! The twins’ latest album, Heartthrob, debuted at number three on Billboard’s Top 200 this week, and they’ll be in the running for a Grammy in just a few short days. As if that weren’t enough, the ladies are hitting the road, making a stop in Madison at the Orpheum on February 24. We know Madison adores this duo, so if you don’t have your tickets yet, don’t delay. They’re going fast. Tickets on sale through our Music Calendar this Friday, February 1 at 10am. We first told you about this adorable, and incredibly talented Aussie duo earlier this year just before they played a powerful show at the High Noon Saloon in March. (Read our interview with the band here.) We are happy to see that their well-deserved success has only grown since then. Check out their recent Daytrotter session to catch up with the band, and grab some fresh downloads. I’m bound to receive more than a few quizzical looks from fellow grammar Nazis by publicly professing my love of Australian indie pop band An Horse, but that’s a risk I’m willing to take. The music created by the duo of Kate Cooper (vocals/guitar) and Damon Cox (drums/vocals) is quickly gathering a healthy worldwide fan base, despite the band being relatively new to the scene. Heck, their full-length debut, Rearrange Beds, isn’t even available in stores yet, but they’ve already enjoyed touring Australia with Death Cab For Cutie and performing stateside dates opening for Tegan and Sara, which brought them to Madison last year. Not bad, eh? Indeed, there’s something tragic and painful about this album, but its songs also possess a palpable layer of positivity, which is just one of the characteristics that make Rearrange Beds such a fascinating listen. On the cover art, a disemboweled figure’s body rests on the cross, picked bare by birds against a backdrop of softly falling snow; a testament to both the naked vulnerability of the emotions lying within, and the nature of new beginnings–resurrection even, if you want to get all religious about it. Take the determined lyrics from the track “Camp Out” for example: “This is a song for the one that I love/I haven’t met them yet/But I’m quietly confident/Although what if like you said/All I’m looking for/It doesn’t exist/Oh I have to believe it does,” followed by the clever nod to Courtney Love and Co: “Like that good Hole album/I can live through this/I can live through worse.” Though Cooper perplexedly claimed to cringe when singing it live, this contemplative bittersweet epic, reminiscent of those great ‘90s alterna-grunge anthems, is easily one of my favorite new songs of 2009. Both in sound and sentiment, An Horse’s debut recalls artists like Mirah, Nada Surf, Rilo Kiley, PJ Harvey and Stars with that mesmerizing indie sparkle. As incredibly powerful as their music is (which is quite, especially when considering they’re only a duo), the poetry of Kate Cooper’s unapologetic lyrics clearly make Rearrange Beds all the more extraordinary. An Horse is, however, anything but a dictatorship. “I don’t really write lyrics. I kind of help arrange the songs with Kate, but she’s really the songwriter in the group,” said Cox. An Horse will play The High Noon Saloon on Wednesday, March 4th at 8:00 pm. Madison’s Whatfor and Milwaukee’s Pezzettino will open the show. Get your tickets now!